While you may be able to treat individual trees to help them recover from whatever ails them, it is different when you need to deal with a stand of trees that is not doing well. Tree stands may suffer from both non-living (abiotic) factors, such as a change in the site’s hydrology, or from biotic factors – insects, disease, rodents, or over-crowding. Have you noticed some areas of your forest that just don’t look quite right? Do you have a certain pocket of trees that looked as healthy as the neighboring trees when you bought the property 15 years ago, but now look different – in size, color, or amount of foliage? These might be clues that the health of your stand of trees needs to be addressed. Perhaps you’re seeing yellow (often referred to as “chlorotic”) foliage on your conifers. This condition could indicate a lack of nitrogen in the soil – either from soils naturally deficient in nitrogen, or from past management practices that depleted soil nutrients. Do your yellow trees happen to be Douglas-fir growing on the Oregon coast, with crowns that seem to be holding only one or two years’ worth of needles? You may be seeing Swiss needle cast, a fungal disease that has spread rapidly over the last couple of decades along much of the central and northern Oregon coast. Long and lanky conifers with nothing but a “poodle tail” of a crown are indicative of an over-crowded stand. While straight trees with minimal taper are desirable when you’re turning your trees into logs for sale, trees with small crowns don’t have the photosynthetic “factory” for vigorous growth. Stands of such trees are also susceptible to windfall, especially after an adjacent harvest removes some of the windbreak trees. Other symptoms that could indicate an unhealthy forest include: trees with large numbers of fungal fruiting bodies (conks) on them, windfallen trees with intact and exposed roots, dense stands of “dog hair” trees, and many others. The key to detecting forest health issues is keen observation. Chances are at least some of your forest – and hopefully all! – will be in a healthy, vigorous state. Take note of what you know to be healthy forest and use it as a basis of comparison for areas that may not be so healthy. It’s important to realize that not all situations are necessarily cause for alarm. Many “unhealthy” conditions in the forest occur naturally at some baseline level. Some of these conditions may even be desirable, depending on your forest management objectives. Think of a single diseased tree that eventually dies and becomes habitat for a cavity-nesting bird. In many ways, that habitat is a desirable condition. It’s only when these unhealthy conditions become so widespread that all or most of your forest is at risk that there is cause for concern. Remember to walk your forest with an open mind and open eyes. 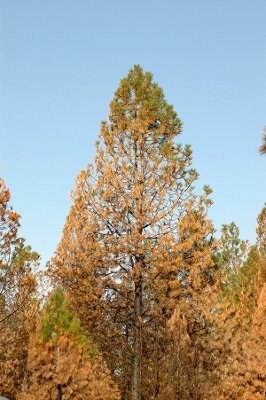 Take a look around to see what seems unusual or “not quite right.” Luckily, there are many free resources – such as your Oregon State University extension forester – to assist you in evaluating the overall health of your forest or woodland, to help with planning, and to provide advice and information on all aspects of forest and woodland management. In addition, there is a whole industry of professionals at your disposal should you want to hire consultants or others to assist you. These and other sources of help are discussed in the “Help & Assistance” section of this web page. Special thanks to OFRI.org for images on this page.